First thing people think about when mentioning food in Bali is Babi Guling. Guling (interestingly translated to bolsters from Google ...) I would more intelligently guess refers to how to how the pig is rolled / rotated when roasting. Babi Guling as a whole just means roast pork, which is similiar to siew yoke, 烧猪, what have you. 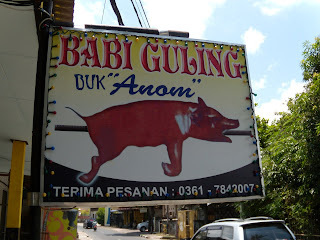 There's an almost unanimously agreed opinion that the best Babi Guling in Bali is up north in Ubud, and in particular at a warung (stall) called Ibu Oka apparently endorsed by Sir A. Bourdain himself. Well I've also read that there's nothing too special about it, and also because we didn't wanna ride 45 minutes up there just to eat. We asked the front desk where's the nearest local / small babi guling where locals but probably not tourists will go. We were redirected to a spot 20 minutes walk away from our resort and off we went! Was a little puzzled when served this - I guess as compared to ordering it in a proper restaurant where they serve you one entire portion of babi guling by itself as a dish, ordering it here gets you a plate of assorted pig stuff with veges, onions and soup, kinda like a complete meal in itself. The satay itself was tough, sweet and spicy but rather flavourful. There were also two types of pork chunks on the plate, both tasted salty and very tough - like jerky. There's also assorted offal which I absolutely cannot identify, fried to oblivion and crispy like a cracker, but very very yum! And of course, the crown jewel is the skin itself, crispy, fatty and awesome with the chilli. Also came with vegies, onions, soup, rice, and all for just about $2. The soup itself was drowned in oil but thick in porky goodness and spices. A great simple meal though to be honest my jaw was really aching chewing all the jerk. While I ponder how the Ibu Oka one might taste like instead, I felt proud to taste it done the way the locals enjoy!